Place potatoes in a large pot with cold water and 1 tablespoon of salt over high heat. Add potatoes to pan; cover and bring to a boil. Reduce heat to medium-high; cook about minutes or until fork tender (making sure not to overcook). Drain potatoes and transfer to large serving bowl. Allow to cool about 10 minutes. While the potatoes are cooling, whisk together the drippings, vinegar, lemon juice, mustard, honey, garlic, and remaining salt + pepper. Slowly whisk in the olive oil, and then stir in the fresh chopped herbs. 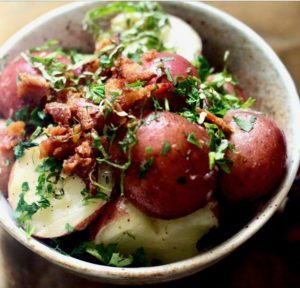 Pour dressing over top of cooled potatoes and crumbled bacon and gently toss to combine ingredients. Finish potato salad with fresh grated parmesan cheese.